World 3 is the third world of Yoshi's Woolly World. 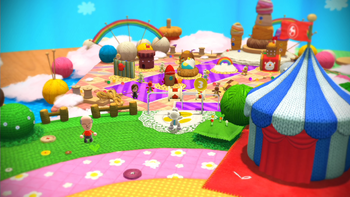 It is a mostly cloud-themed world, featuring elements related to toys and candy. As in all other worlds, there are nine levels: eight compulsory, and one special level that is unlocked after all other Smiley Flowers in the previous levels in the world are collected. Completion of this world unlocks World 4. Yoshi and Cookies A level with cookie platforms and Snoots. Wobble Mobile Jaunt A level with several mobiles. Scarf-Roll Scamper A level with lots of climbable walls designed to look like scarves. Big Montgomery's Bubble Fort A fortress level where Big Montgomery is fought a second time. Fluffin' Puffin Babysitting A level that introduces the mechanic of Fluffin' Puffin chicks. A-Mazing Post Pounding A subterranean level with posts. Fanciful Fluff and Feathers A sky level with clouds, rainbows, and Goonies. Miss Cluck the Insincere's Castle A castle level where Miss Cluck the Insincere is fought. Woollet Bill's Last Ride A level that features many Woollet Bills.